Stock market investment is like taking ride of “merry go round”, it gives enjoyment of upward stock movement and worry of downward stock movement. If you have invested your money in stock market it is extremely important for you to monitor your stock performance. Close monitoring will enable you to take appropriate action for buying and selling. 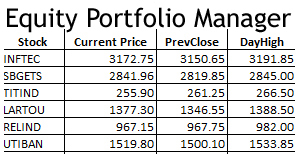 In order to monitor all these stock at single place you need to make your equity portfolio. Equity portfolio enables you to analyses your portfolio and track its movements at any point of time. In our earlier post we have discussed about ETportfolio tool. Today we will discuss about our own customized Equity portfolio Manager Excel based tool. You can download Equity Portfolio Manager by clicking on link given below. This Equity portfolio manager contains three different spreadsheets. First spreadsheet named as Instruction contains instruction about how to use this portfolio. Second sheet is named as Money_Excel contain information about your stock holding, profit and loss details. Third spreadsheet contains information about stock name and respective codes. Please following steps to use this portfolio. Please find out code of your stock and insert this code in first column A – “Stock”. Once you are done Press “Update Now” button and you will see that stock price is getting updated. Note – In order to update stock price Internet connectivity is mandatory. 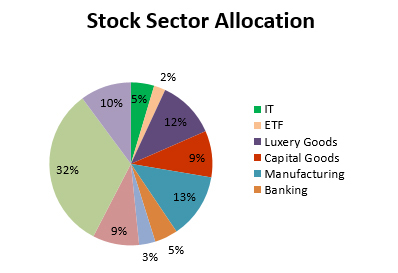 This portfolio manager also provide you additional facility in terms of giving visual representation about stock sector allocation percentage. This will enable you to check if you are exceeding investment in specific sector. 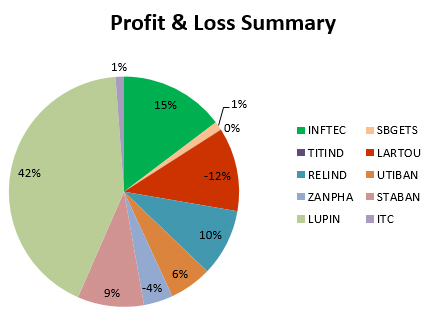 Another good feature of this portfolio manager is visual representation of profit and loss stock wise summary. Hope this portfolio manager will help you to manage your equity investment more effectively. If you like this tool please share it with your friends and relatives. Don’t forget to Like, share or tweet it if you like this. Very nice one. It will save lot of time..
1.Whether there is option to add new rows to Money_Excel tab of the excel sheet? For me, the Insert Option is not coming up. 2. Are you planning to upgrade this excel to include stock split and dividends to give more clarity on return and avoid manual intervention? Thanks for pointing out very good improvement. 1. Please download new Equity portfolio tracker and you will be able to insert more rows. 2. We will make provision for stock split and dividend in our next version. Make sure you are connected to Internet. Press Update Now button after connecting to Internet and it will surely work.